Lowcountry. One word. As if it’s a way of life. Life in the Lowcountry. It’s sunk down low in the earth, by the sea. Robby Cochran felt the difference, in the heat, in the sweat, like a blast furnace. Been living in the north too long that he almost forgot the heat. The air was still and hot inland. Breezy and warm by degrees by the sea. But he’d adapt. He always did. Robby had been driving since the morning, after stopping and staying the night outside D.C. He got out of NYC late the afternoon the day before and made it to a Marriott Courtyard in Springfield, VA before his eyes closed. It was twenty-four hours after turning in the keys to the New York apartment and calling home to leave a message for Savannah in Connecticut. He didn’t say much except that he was heading south, as if she’d care. He wasn’t calling for her benefit. Maybe the sitter would play it for Rebecca. There was always that chance. Continue Chapter Three of the serial Blacksmith's Girl. Robby Cochran can divide his baseball career into three distinct phases. The third phase came to an end the moment he cracked open Atlanta Braves' third baseman Leo Boxley’s head, a blow that hemorrhaged Boxley’s cerebral cortex and killed him en route to Flushing Hospital Medical Center on October 15, 2002. The second phase began when the Montreal Expos dumped Cochran’s salary in 1991 in a mass purge of expensive contracts, like they did before and since with other promising starters like Randy Johnson and Pedro Martinez. Cochran was never in their league, despite what his agent professed, and his questionable rotator cuff and high price tag left him without any major league takers. Continue Chapter Two of the serial Blacksmith's Girl. We've been teasing some upcoming changes to Subdivided Meets Marathon. At long last, it appears that some of those changes are in the works -- and with any luck, they'll be implemented by August. In the meantime, I'll be doing a bunch of work on the back-end of this site. Which is my way of saying that my postings will be short and sweet for the next couple of weeks. Fear not, however, as Marathon Man has pledged to twice-weekly updates of his serialized novel, Blacksmith's Girl. Look for those on Tuesdays and Thursdays. I'll fill in with some random crap on some of the off-days. What, do you suppose, is the most rock-and-roll moment in a rock-and-roll record? (A brief explanation -- I'm not looking for "events," such as Woodstock, or Hendrix setting his guitar on fire, or Led Zeppelin and a groupie and a mudshark. I'm looking strictly for a moment -- a lyric, a solo, a shriek) within a recording. "A-wop-bop-a-lu-bop-a-wop-bam-boom" from Little Richard's "Tutti Frutti." The opening chords of "I Wanna Hold Your Hand"
The guitar riff from "Satisfaction"
Roger Daltrey's scream near the end of "Won't Get Fooled Again" is the most rock-and-roll moment in rock-and-roll. UPDATE: I was just kidding with Wham! Robby Cochran is a notorious ex-big league pitcher who returns home to his roots in coastal South Carolina to escape the aftermath of a manslaughter charge and a messy divorce. He’s lured back home by the prospects of a job and the memory of a beautiful girl, the daughter of a blacksmith. She’s married now to his best old ex-friend, the wealthy owner of a golf resort by the sea who has a treacherous plan for his old ball-playing buddy. With his future uncertain, and with no place else to go, Robby goes back home to recapture his past. The first pitch was high and tight just under Leo Boxley’s chin. Face it. The dude plain crowded the plate. Always did. He hung over it with those armor plates on his elbows that were meant to guard him, make him seem fearless. But in reality that body armor just showed pitchers like Bullet Train Cochran what a spineless wimp a guy like Leo Boxley really was at heart. 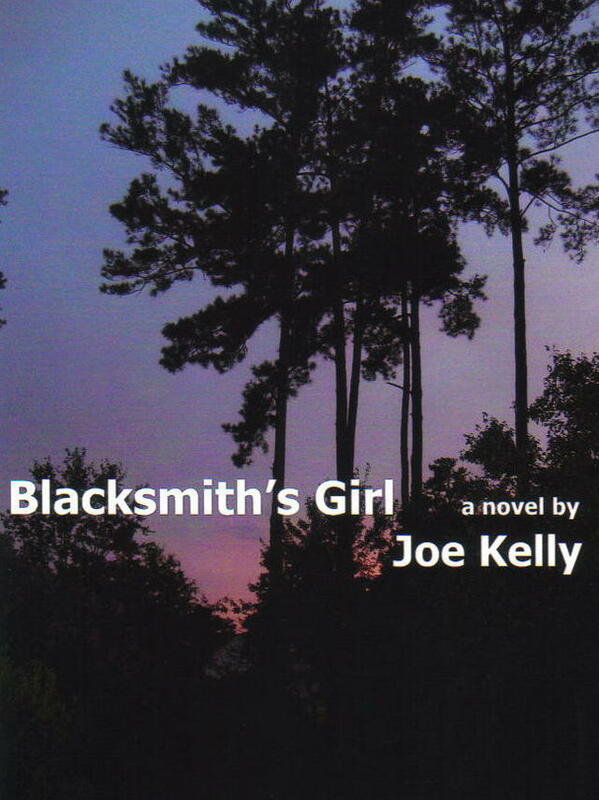 Continue Chapter One of Joe Kelly's serialized novel Blacksmith's Girl. It's been a long time. Been a long time. Been a long, lonely, lonely, lonely, lonely, lonely...time. I'm back to contribute something/anything to Bob's long time solo blogging act. And make it a duo once again. As Bob has reported, I'm in the market for a new career after finishing up a brand new masters degree, this one in the exciting, timely, crowded field of international relations. While I'm at that I'm also in the midst of writing a new book...actually picking up after one that I cast aside a couple of years ago. I've done that quite often: cast aside a book idea or a work in progress. I read where Stephen King has called these "trunk" novels. Books that he has written and then with dismay or dissatisfaction stashed away in a trunk. Only to open the trunk many years later and publishing the rediscovered books under the Richard Bachman moniker. I haven't been keeping old books in trunks. There are some legal pads with indecipherable scrawl piled up in boxes. But there are also old files of stories and false starts in folders on an external back-up hard drive. It's in one of those electric files that I've picked up some notes and beginnings of the book that I'm currently working on. In trolling around the old files I also came upon a fairly substantial part of another book, a kind of film noir homage, that I wrote around three years ago before we moved to South Carolina but almost completely forgot about. It was a story that I first wrote as a screenplay years before to zero attention and even less acclaim. But it's a story that stayed with me and after setting it aside for awhile I'm surprised that unlike most of the rediscovered stuff I've written in the past this one still seems fun and entertaining. It's set in South Carolina, written before I actually lived there. And there's enough of it written already that it wouldn't take much struggle (I think) to finish it (I hope). The added experience of living in the locale might also help in sharpening the book's focus. So...here's what I'm thinking, and Bob has graciously agreed: I'd like to roll it out as a serialized novel on this here blog. Okay. This sort of thing has been done before. And it's not the favorite way to read a book. But with nothing to lose, and with no other plans for the story, I'm going to give it a shot, shoot out a couple of installments a week (on Tuesdays and Thursdays), and see what happens. As soon as Bob gives me the go sign! I've been keeping a couple of secrets from you, dear friends, and its time to come clean on a couple of things. A few weeks back, yellojkt participated in a meme -- something to the effect of "reveal something about yourself that you've never revealed before." I participated, but my revelation wasn't particularly revelatory, especially to anyone who has known me or even read this blog for any length of time. I, Robert L. Braughler, am such a wuss that I can't bring myself to "kill" words, or even letters. Doesn't make much sense, does it? Allow me to explain -- no, wait, there is too much. Allow me to sum up. Let's say I've just typed something. A phrase, for example, such as...oh...."My desk is cluttered with candy wrappers and artwork by my kids." Now, the easy thing to do would be to simply delete the original sentence, and then type the new one, right? Yes, it would -- but it's not what I do. Instead, I will delete the words from the first sentence that are no longer to be used, but keep the words that I'm still using, and then type the new crap around it. Sign of a much more deep-seeded problem? Testify, brother! I have no doubt that this pointless habit costs me greatly in terms of productivity, but I can't stop. Sometimes, I'm even compelled to "conserve" individual letters. Some little part of me feels bad when I wipe stuff out of existence, even "electronic" stuff that has no tangible existence other than as a string of ones and zeros on a hard drive. I'm pretty sure that this stems from my mom -- who was, God bless her, a fabulous woman in every way imaginable, but she did instill an empathy for inanimate objects in her son that haunts me to this day. For the past few years, I have been attending an annual Drum Corps competition. And enjoying it. While for most of you, this particular bit of information merits nothing more than a shoulder shrug and an "eh," believe me -- if you had been among my circle of associates in high school ("band fags," our classmates labelled us, and it was a name we accepted and eventually embraced), this confession would be right up there among the worst things you could possibly ever own up to. Yes, we were IN the band. And yes, basically our entire social lives revolved around being in the band. But dammit, we refused to accept or even acknowledge the fact that maybe, deep down somewhere in a hidden recess, we actually LIKED being in the band. We were the band REBELS, dammit. Outlaws. The ANTI-band, if you will. So believe me, every time I'm attending a DCI competition, a little bit of me is keeping an eye open for anyone I know, just to avoid being seen. To get to the competition, we have to walk a short distance on Route 51, which is a busy artery -- and every time we make the walk, I'm trying to make myself as invisible as possible, just in case one of my old band-fag compatriots might be driving by. But no more. I am band-fag, hear me roar! I'm OUT OF THE CLOSET, BABY, AND LOVING EVERY MINUTE OF IT! And as final proof of my new lack of self-loathing, I leave you with a video from a DCI competition, just in case you have no idea what I'm talking about. Following is a performance by The Cavaliers from last year's DCI finals. Just to put it into a little whit of context for you, the performance is called "The Machine." Enjoy. Blatant comment whoringtm: What's your big (or little) secret? Isle of Sodor (AP): In a development that has sent shockwaves through this tiny island, Station Controller Sir Toppham Hatt announced that James the Red Engine has been recalled, and will be melted down for scrap. While the death sentence has been discussed before in relations to the crimson #5 engine, for offenses such as crashing into a tar engine, or breaking a coach's brake pipe (an incident made less egregious by the judicious use of a passenger's bootlace), Hatt has repeatedly spared James, proclaiming him to be a "Really useful, albeit sometimes high-spirited, engine." Most of the engines on the Sodor line have refused comment, although it has long been believed that James is less than popular among his colleagues, owing to his boastful nature and inordinate pride in his red paint -- a feature that has led him to believe, incorrectly, that he is not meant to pull anything other than coaches. Speaking under the cover of anonymity, a close associate of James muttered, "Good riddance to bootstrap boy. He wasn't without his merits, of course, but he certainly wasn't anywhere near as important as the fastest engine on Sodor. Poop poop!" James' execution will be the first to be carried out since the controversial 1997 Skarloey meltdown. Yes, friends, the lovely Katie up there holds the coveted title of "Miss One Day Garages." For at least a decade, ads featuring an ongoing procession of "Miss One Day Garages" have appeared in the Post-Gazette. How does one become Miss One Day Garage? Can one attend the Miss One Day Garage pageant? Is it possible to discuss Miss One Day Garage without using double-entendres such as "tool," "tailpipe" and "screw?" Does she get a tiara? Please, God, tell me there's a tiara. Just look at that woman. She is, without question, certifiable. And don't get me wrong, I'm well aware of the short-term benefits of dating crazy women. 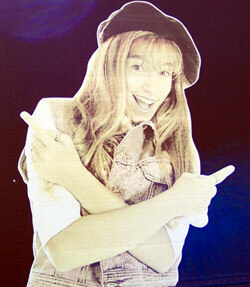 They're loads of fun -- right up until that magical moment when she jabs a dull butter knife into your thigh. So go. 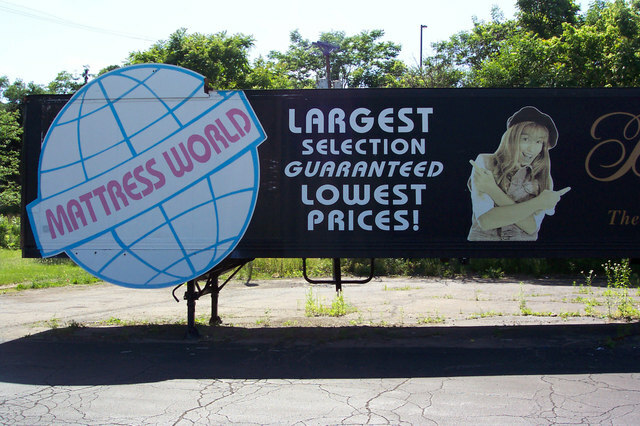 Go buy a mattress from this place, if you dare. Just don't come hobbling to me when you need someone to remove that kitchen utensil from your leg. "Give me a break, I couldn't be more excited about your mattress, I must say. It's making me so mental! They certainly are a bunch of decent fellows there, I must say." The following two images have been featured, prominently, in two different forms of Pittsburgh advertising media for at least the past five years. First, a clip from a print ad. Tell me exactly what the two lovely young ladies above are selling. The first person to get them both, and to furthermore tell me the prestigious title held by the woman in the first picture, gets one of my cherished Brighton Hot Dog Christmas cups.